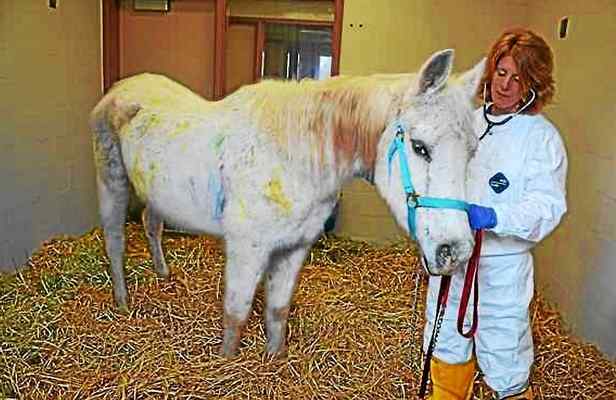 Lily, the horse who gained national attention after getting shot up with a paintball gun, apparently died from a fall, causing her neck to break. Tracey Stewart, who with her TV personality husband Jon adopted the horse last month, said she had grown to love the horse and spent much time with her at their 12-acre Bufflehead Farm in Colts Neck, New Jersey. Stewart said although they took very good care of the 20-year old Appaloosa/Arabian mix, it had health issues, some of them relating to the abuse she suffered at the hands of the person or persons who pelted her with paintballs while she was at the New Holland Sales Stables in Lancaster County earlier this year. Stewart said she has no regrets adopting Lily, and she said she feels comforted she and her husband were able to treat the horse well in its final days. “The hardest part of adopting animals that have suffered neglect is that you often don’t get to spend as much time as your heart would have liked,” she said. The person or persons responsible for Lily’s injuries from the paintball gun still have not been caught. A reward of $10,000 is being offered for information leading to the arrest and conviction of those who shot Lily. People for the Ethical Treatment of Animals (PETA) is contributing $4,000 toward the reward, the Humane Society another $5,000, and Omega Horse Rescue is chipping in $1,000. Update: Wild Horse and Burro Radio covers BLM’s “Final Solution” for Exterminating America’s Protected Wild Herds, TONIGHT!! At least Lily spent her last days in comfort and with loving people. Thank you to the Stewarts and everyone who helped them. Sad. It is not sad that Lily passed on because everyone and everything passes on but the abuse that she suffered (and many more animals suffer every single day) is the part that is sad. Lily, at least, did have good care and friends at the end of her life and that is a blessing. RIP, Lilly, and prayers and positive energy for your kind adopters at this difficult time. RIP, Lily.. At least she was loved & cared for by the Stewarts & everyone else involved who truly cared about her. She spent her last days with people who truly cared about her. Too many of our beloved equines do not experience the same result here. They are just tossed away like they are nothing, & I hate the humans who have no regard or compassion for all of the innocent horses & wild burros, or any other creatures who have a right to exist. I just cannot comprehend what some humans do to the innocent ones. How sad. But at least she was rescued and knew kindness and, I hope, some happiness. She may have had internal injuries from that unbelievably vicious paintball incident too. 😦 Thanks to the Stewarts and others involved in her rescue and care.